With the help of Creative Market and the talents of Lisa Glanz, you can now easily create a super adorable wedding portrait of the bride and groom for your wedding stationery or even your bridesmaids for the perfect personalized gift. And, if you’re a professional - why not create a whimsical self-portrait of yourself for your social media avatars or even your site’s about page? Another fun idea is to create a fun portrait of yourself after the wedding for your wedding thank you cards and then you can include a real photo inside to surprise your recipients with. 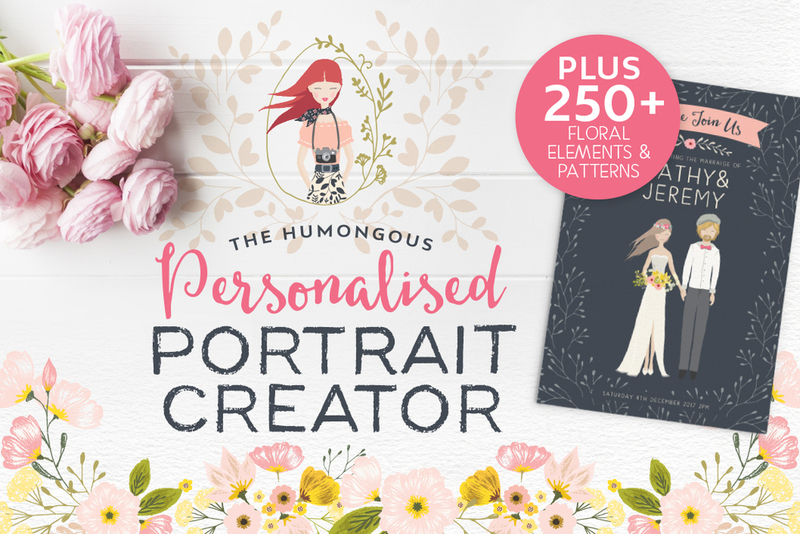 In this Personalized Portrait Creator kit - the options are endless as there are over 120 patterns which are perfect for the portrait outfits or simply to use as a background. And then there’s even 120 floral elements to use anyway you wish. What color hair and style will your portrait have?